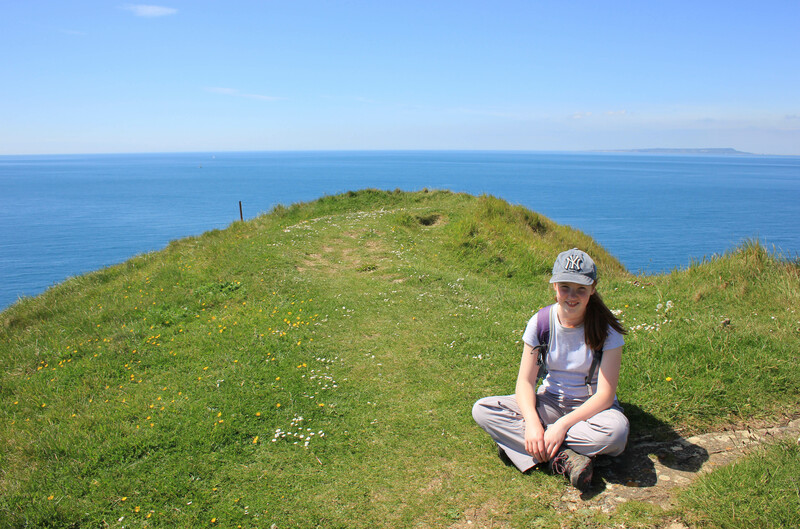 There is more than one route out of Tyneham to get back to the coast. 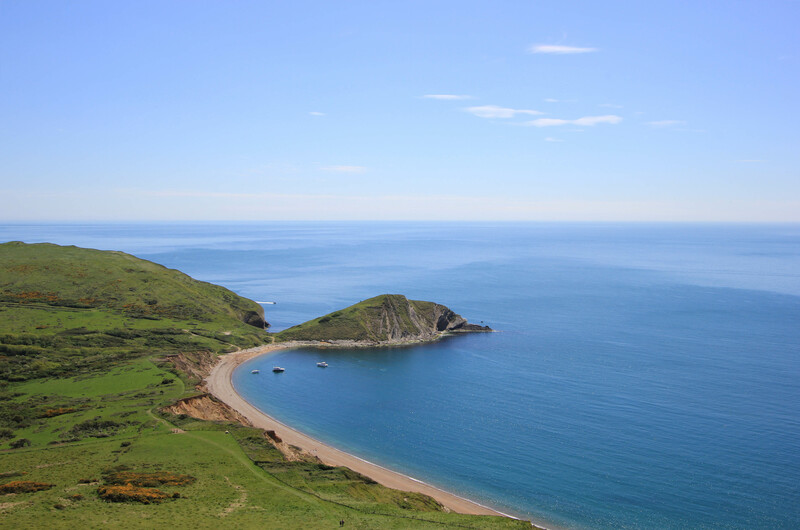 The easiest is the flat route, heading west along a made-up track to Worbarrow Bay. We could have taken this path, and I saw my son looking down it with a certain longing. It was not for us, however. We had to head due south and climb back up to the top of Gad Cliff, to the same point we had left a couple of hours earlier for our inland detour. 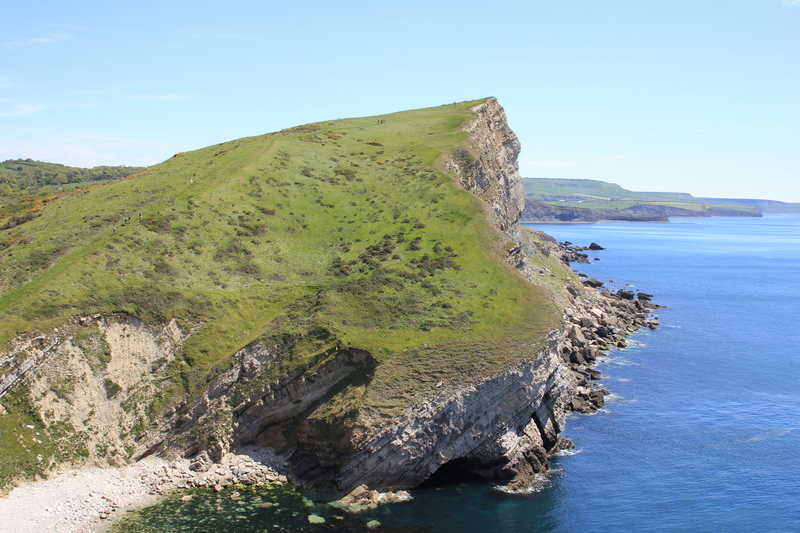 Once we had returned to our vantage point we then set off west and down to Worbarrow Bay. My son reminded me on more than one occasion that we could have taken the easier path; I reminded him more than once that when you walk the coast of Britain you do actually have to follow the coast. I am rather pernickety about such things. What I liked best about Worbarrow Bay is Worbarrow Tout. It is a promontory of high land (the word tout comes from the Middle English word tuten, meaning to look out, or peer) which was once part of Gad Cliff before becoming separated from it by erosion. 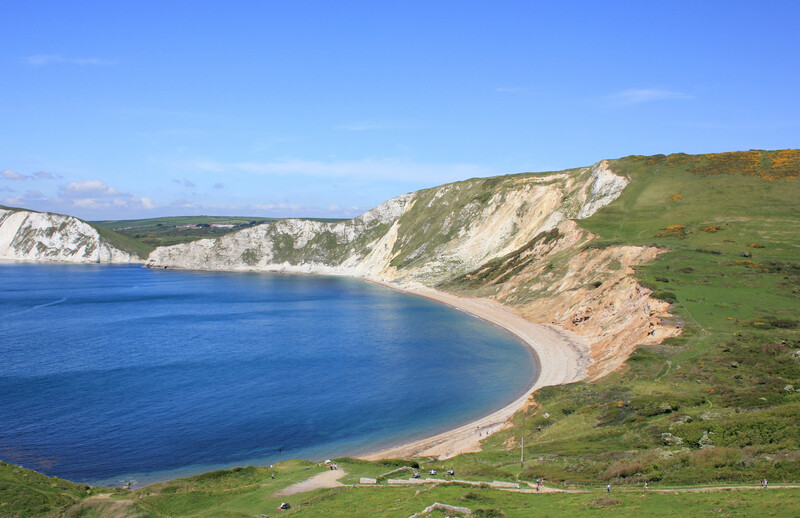 In fact, the best views of Worbarrow Tout are from the cliffs above Worbarrow Bay, to the west of where we were. Worbarrow Tout is only a short climb, and worth it for the views. In the far distance, on the horizon, we could see the Isle of Portland. Opposite Worbarrow Tout, looking back east, is Pondfield Cove. 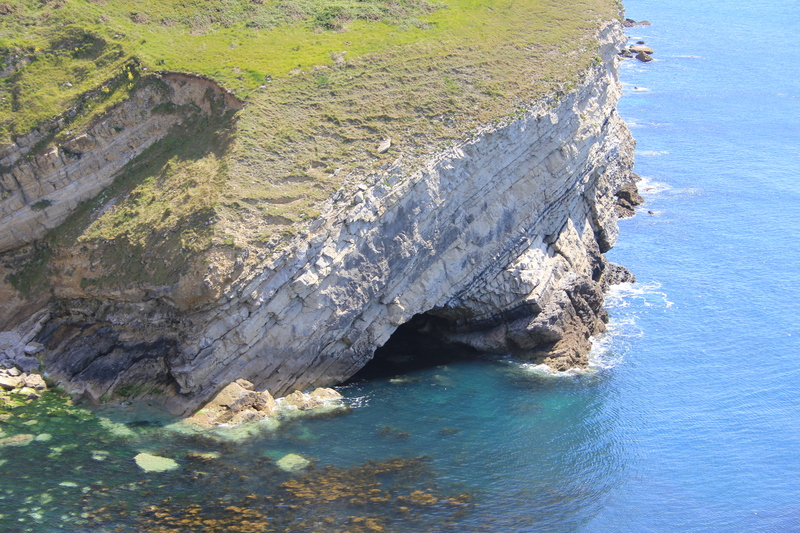 The strata in the rock here angle upwards steeply, along with much of the Jurassic Coast. This sharp upward trend is a result of the African and European continents colliding some 30 million years ago, causing the rock to fold and push upwards. This upward movement has exposed rock formed over literally millions of years. The cliffs shown in these few photos alone span some 75 million years worth of formation. Pondfield Cove was formed when the sea eroded through the stronger Portland Stone, reaching the softer Purbeck beds of clay and limestone behind. These eroded more quickly, widening out to form the cove itself. What was it? The rusted shell of a Second World War mine, hauled out of the sea? No! We guessed its age, but not its purpose. This was the turret of an Allen-Williams pillbox. A steel and brick pit would be dug into the ground and topped with this metal turret. The pillbox could take a “garrison” of two or three men, and the turret swiveled through 360°. The turret had a front loophole and also a top window, allowing a machine gun to cover the entire area. According to the manufacturer, four men could dig the hole and erect it within two hours. It would take 30 minutes to remove completely. According to Wikipedia almost 200 of these were manufactured, but only 33 remain today. This was one of them. 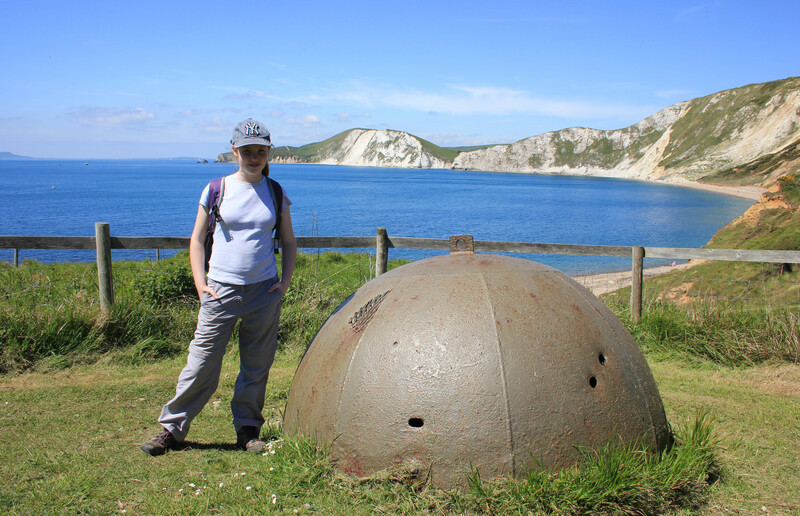 This entry was posted in Dorset and tagged coast, Dorset, geology, pill box, travel, walking, Worbarrow. Bookmark the permalink.